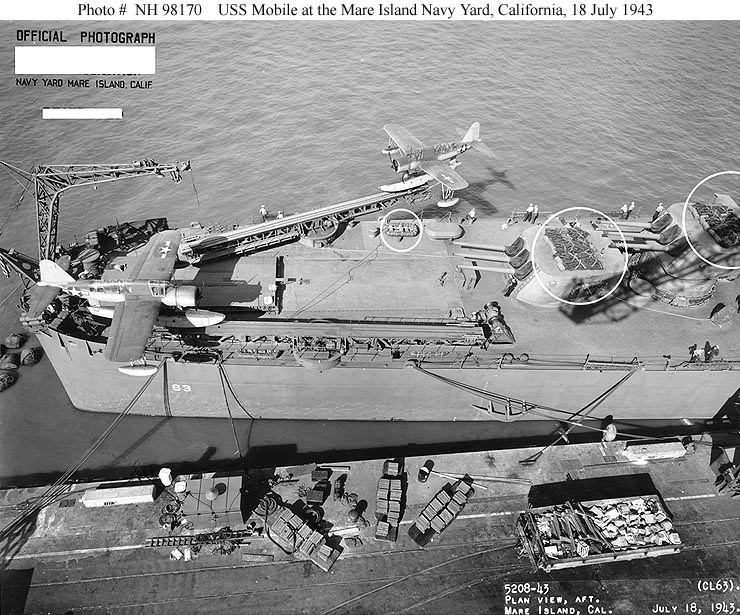 610' by 66'3" by 24'7"
1942-11: Light antiaircraft increased to 4x2, 2x4 40mm guns. 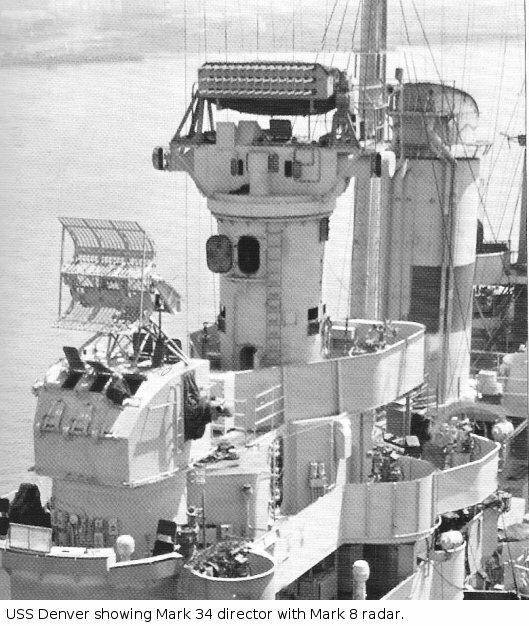 All units equipped with SG and FC radar by 1943-6. One catapult removed late in the war. 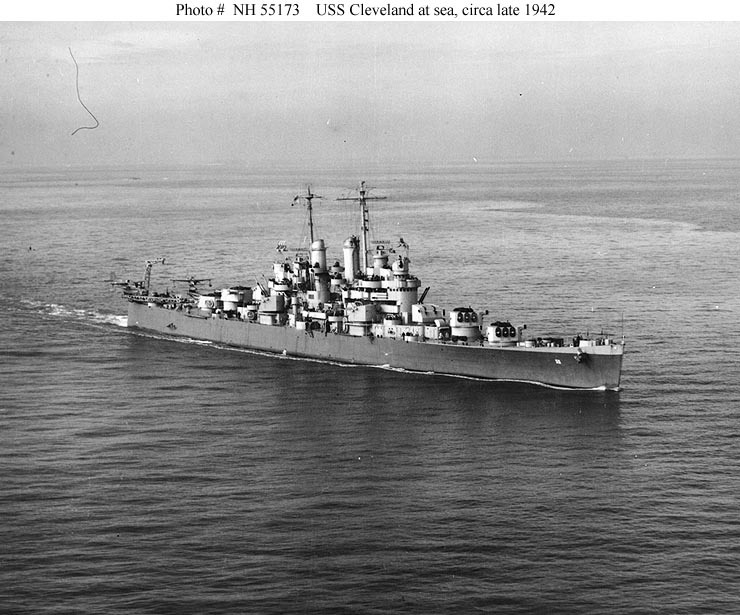 The Clevelands were completed in 1942-45. Based largely on the Brooklyns, these were excellent ships, with good firepower, protection, and basic toughness. 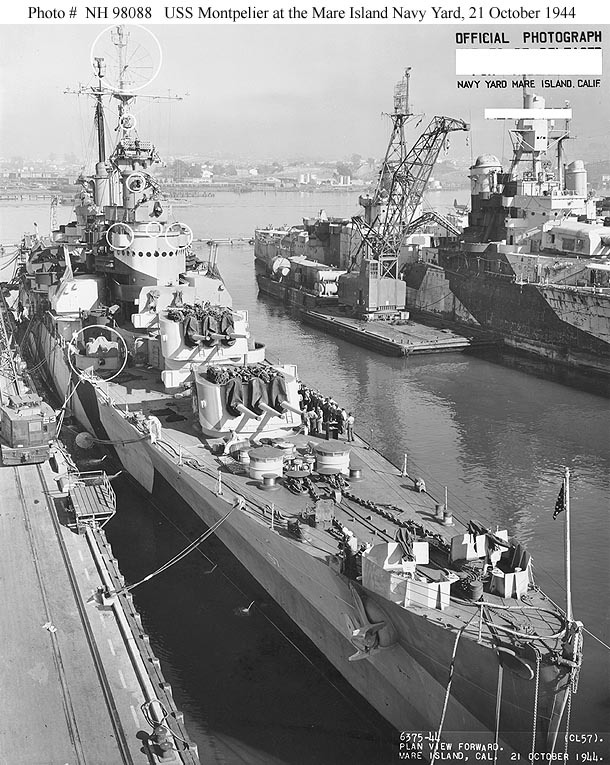 The second Houston survived two torpedo hits that resulted in over 9000 tons of flooding, a remarkable demonstration of hull strength. Their machinery was well-dispersed and they were very maneuverable. Their greatest weakness, which they shared with too many other American designs, was that they were top heavy. Perhaps this explains why members of other services often referred to American sailors as "pukes." 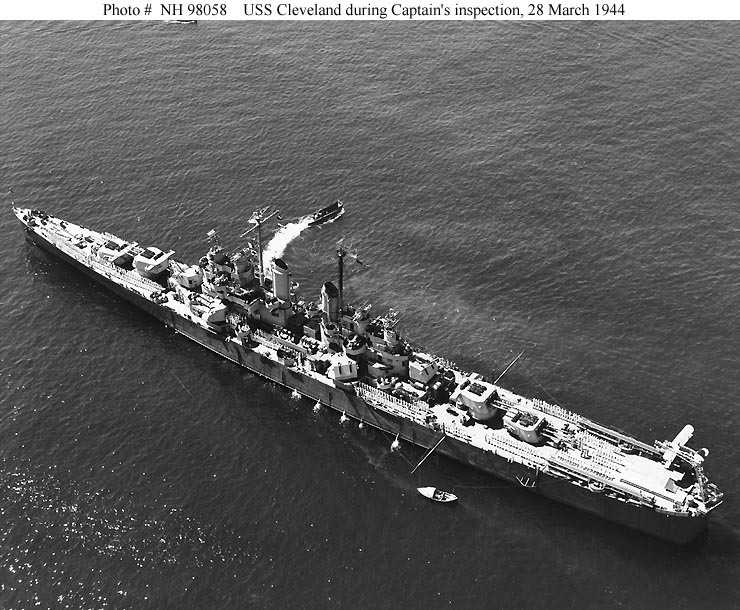 The design went back to 1938, when the tentative FY40 program called for two 8000-ton cruisers. The projected numbers went up as the world crisis deepened, and by May 1939 the features being demanded had evolved beyond what could be fit on an 8000-ton displacement. 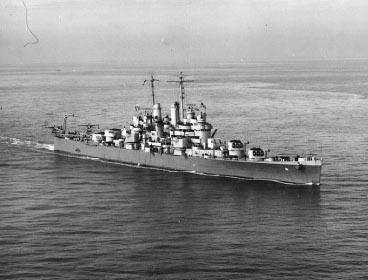 The outbreak of war in Europe effectively ended the treaty limitations, and new cruisers were needed in a hurry, leading to a decision on 2 October 1939 to base the new ships on Helena, the final Brooklyn to be completed. 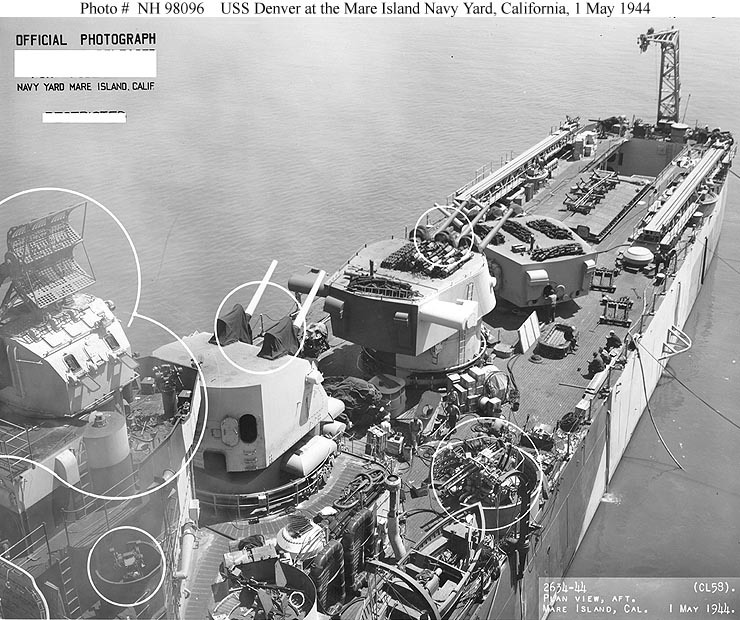 The most visible difference was the replacement of one main turret with an additional pair of heavy antiaircraft turrets. Stability concerns also required a larger beam. 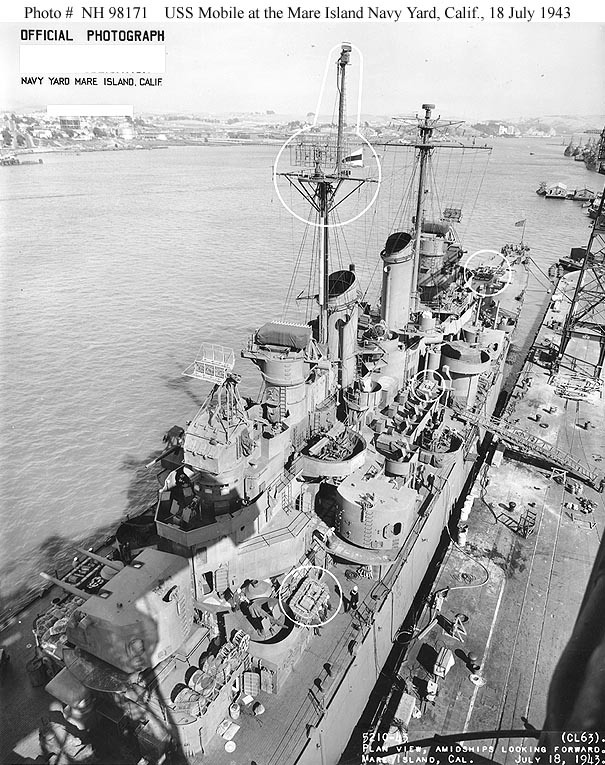 None were lost in combat, though, as previously noted, Houston came very close to being lost off Formosa. 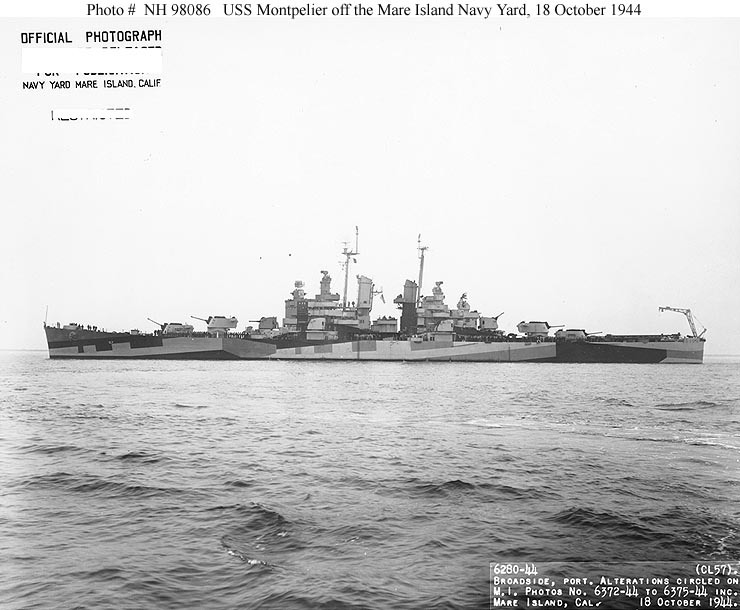 Several units of this class were converted on the ways to Independence-class light carriers.